Cod, Plaice, Salmon, Tuna The perfect variety pack for fish-loving felines! Our delicious FELIX® As Good As It Looks Adult Cat Ocean Feasts in Jelly include the mouth-watering tastes and textures of cod, plaice, salmon and tuna. A great way to provide your cat with a varied diet, our 100% complete and balanced nutrition will provide your cat with all he needs to maintain a healthy and happy lifestyle. We use high quality, natural ingredients in our delicious recipes with a combination of tastes and textures we're sure he'll love! 100% of your cat's daily needs. Irresistible meals for mischief makers. Vitamins D & E. Balanced minerals. Source of omega 6. ...Is a range of delicious meals which look and smell so meaty, it looks like food you might have cooked yourself. Specially prepared with tender meaty pieces in a succulent jelly, we are sure your cat will find it irresistible at every mealtime. 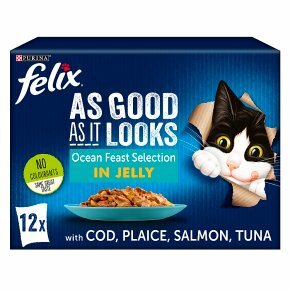 Also, Felix As Good as It Looks is available in a wide range of fishy and meaty flavours to satisfy your cat's love of variety. That's not all! These delicious meals are A source of essential Omega 6 fatty acids. The right combination of balanced minerals. Contains Vitamins D&E. They are full of healthy goodness to satisfy 100% of your cat's daily needs when fed according to the feeding guidelines on the pack.